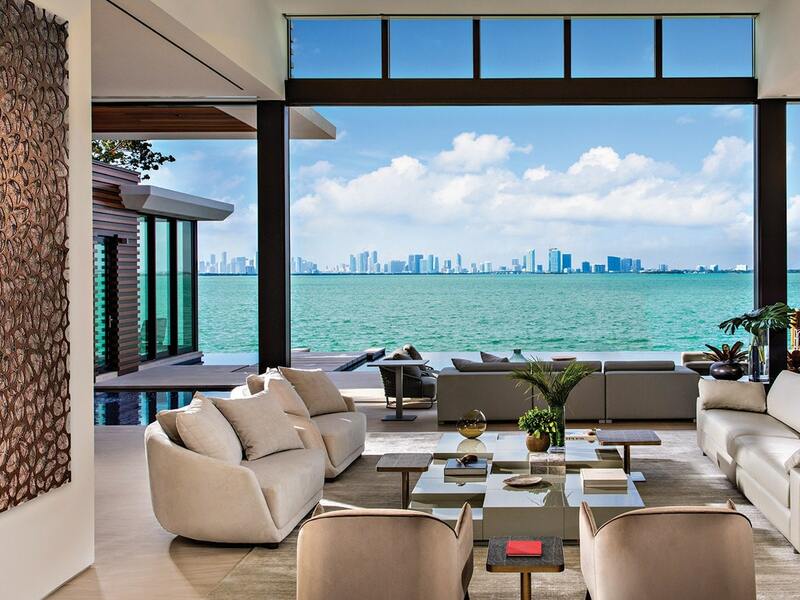 The views are endless in the inside-out world of 34 La Gorce. With floor-to-ceiling windows surrounding the house, 34 La Gorce is a match made in Miami Beach. You can say that Miami Beach is a place that’s hung up on looks, but when it comes to real estate there’s nothing superficial about it. The glistening bay, the magnificent sunsets, the city views from across the water—it’s all what buyers from around the world fantasize about, and the picture-perfect home exists at 34 La Gorce Circle. 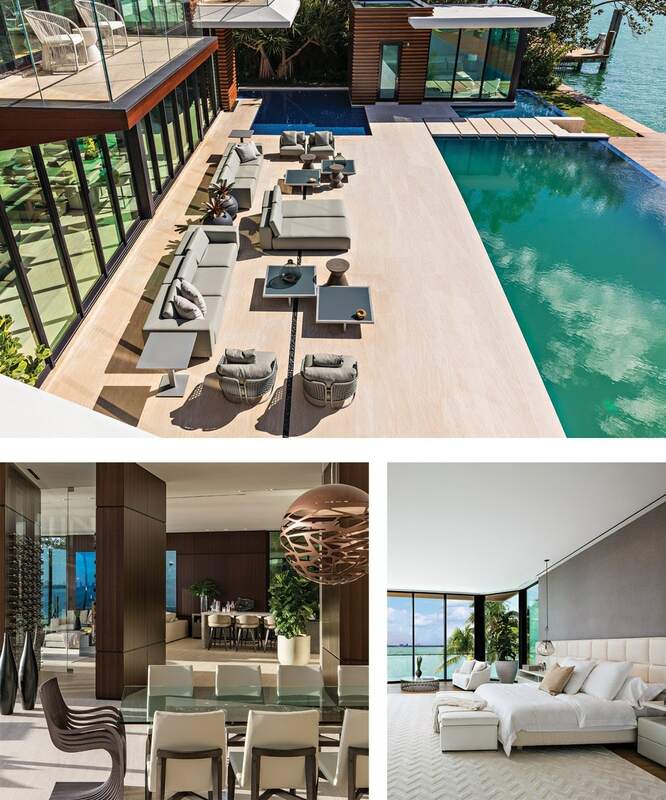 Recently listed for $38 million, the contemporary 11,000-square foot, seven-bedroom residence on the 23,000-square-foot tip lot is pure eye candy inside and out with architect Kobi Karp and Brazilian design house Artefacto teaming up to create a palace with postcard views. FROM LEFT: Besides the balconies, there’s a 390-square-foot mezzanine deck that leads to the water; a grand staircase connects the living room to the second floor. The turnkey home features a six-seat movie theater, meditation garden with 30-foot-tall bamboo, maid’s quarters, a walk-in all-glass enclosed 200-plus-bottle wine room and a private elevator to the second floor and the 863-square-foot rooftop lounge area. Inside the Lualdi Italian interior doors, among the Spanish limestone and European white oak floors, Artefacto created a fully furnished masterpiece with items like the two Everest coffee tables located in the center of the main living room, a Kerthy dining table with a one-of-a-kind refurbished wood beam imported from India and three handcrafted Mitchell headboards with Joker II nightstands in the master bedroom. CLOCKWISE FROM TOP: View of the pool from the second floor; the master suite offers stunning ocean vistas; the living room combines dark and light accents.